Double CD, loads of acoustic guitars and chord instruments from the the founder of Genesis. Years ago this record would have probably been part of the Private Parts And Pieces series, with which Phillips associated all the instrumental albums recorded at home often with only one instrument. But since he became more involved with library music and TV wildlife soundtracks, Genesis first guitarist basically has little time for his own proper production. And in fact he needed some six years to do this album, and this had never happened before. 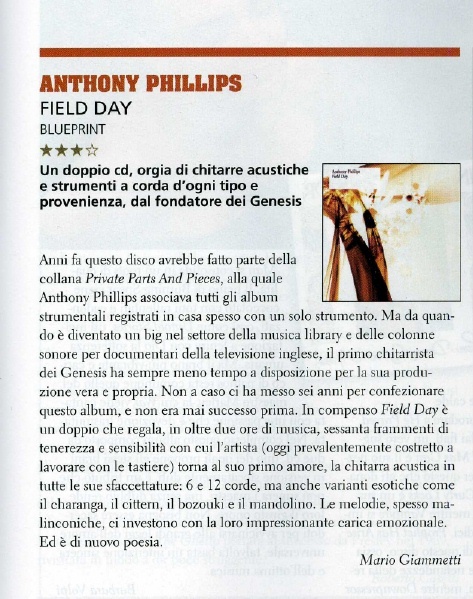 On the other hand, Field Day is a double album which gives us, in more than two hours, about 60 fragments of tenderness and sensitiveness where the artist (nowadays mainly working with keyboards) returns to his first love: the acoustic guitar. Not only in various guises: 6 and 12 strings, but also exotic instruments like charanga, cittern, bazouki and mandolin. The melodies, often melancholic, assail us with their impressing emotional strength. And it is poetry again. Special thanks to Mario for kindly supplying the copy of the review and the English translation.